Apologies for the late post today! Long travel back from Thanksgiving, but we're back in the saddle full time, all time, every day for the foreseeable future. Today's slate features lots of fast paced team (though not a lot of obvious punts at this point), so let's get to it. 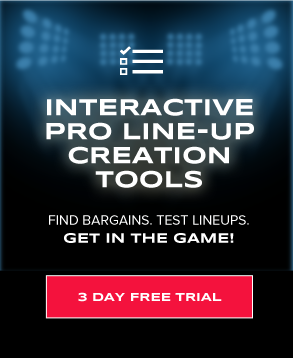 Now’s your chance to get DFSR PRO, which will give you access to our NBA optimizer, our NFL Optimizer, and our new NFL player lab! Get started for free by clicking the button below. Wall is locked into a high 30s minute rotation at the moment, and he paid 5x points per dollar on these prices in three straight match-ups before running into a meat grinder in San Antonio. This match up is the opposite of that. What's the opposite of a meat grinder? A... meat maker? Let's pretend this isn't happening. The Kings have slowed things down this season, but it hasn't helped their putrid defense any - their 108.4 defensive efficiency rating is the 4th worst in the NBA this season. Collison's return really hasn't improved things for them on the defensive end, and the Wiz have the 2nd highest implied total of the day. Wall is a great cash game anchor with big upside as well. Derrick Rose has quietly taken on a mid-thirties minute rotation in New York, and it's doing wonders for his daily fantasy basketball value. A quick word before we move on - we've talked to the best in the industry (and we fancy ourselves decent as well), and you should know that projecting opportunity is where most of the money is made in DFS NBA. Rose wasn't projected to play this many minutes this season, but he is, and he's doing quite well with them. He went off for nearly 8x points per dollar in the game against Charlotte and has been good for a solid 5x points per dollar in non-blowouts prior to that game. Russell Westbrook has been too busy triple-doubling each game to shut down opposing point guards - the Thunder have allowed the 5th most fantasy points per dollar this season - and I think Rose should be very solid in what Vegas sees as a pick 'em. I considered Westbrook here, but it's boring to right the same thing every day. You can read a quick note about him after this. Lowry has re-assumed a healthy workload in Toronto with DeRozan coming back down to Earth a bit, and he's back to being a solid high floor option in the $8,000 price range. He's got the 8th overall time of possession per game this season, and his rotation is as solid as ever. The Sixers, meanwhile, are continuing their long standing tradition of not playing any decent point guard defenders. Bayless, Rodriguez, McConnell - these are all guys that have trouble sticking because they are bad defensively. The Sixers have allowed the 8th most fantasy points to opposing point guards this season, and while Lowry isn't really a GPP play, I like his floor here. A note on Russell Westbrook: He's a beast, obviously, but holy crap is he expensive right now. I'm not sure he'll wind up making the cut unless we see some big punts come in, but I wouldn't be surprised if the lineup optimizer decides to make room for him. But you don't need to hear about how great he is every single day, yeah? Consider Kemba Walker if Nic Batum is out again, though he's listed as probable at this point. Fantasy Factor is offering a one time deposit bonus offer for DFSR customers. They will credit $10 FREE CASH to your account with any registration into the NHL Private League they are running. The private league has a $25 entry and runs over 6 weeks. The first round is made up of several daily NHL contests, highest scores go through to the next rounds, which are elimination format. First prize is half the prize pool and they are throwing in an NHL jersey as a bonus for the winner! What's to see here? Beal is just underpriced. He's averaged better than 20 shots per game in his last 4 contests, and Washington is jamming him in there for high 30s-low 40s minutes per game again. He's topped 44 fantasy points in 3 of those 4 games, including putting up 44 against the Spurs. The Kings are no Spurs. Let's not belabor the point - Beal is a phenomenal play in any format. After some early season shooting woes, Oladipo has settled into being solid if unspectacular on these prices. You're paying the most that you have had to all season, but it's still within the range of value for sure. As our model predicted, Oladipo's FG% and 3PT% have both risen this season thanks to the better looks generated by the existence of Russell Westbrook, and he does enough across the board to not be as volatile as a lot of other options at the position. The Knicks have been terrible against shooting guards this season, allowing the 2nd most fantasy points to them in spite of playing just a league average pace. Big floor for Dipo here. A much more volatile option than the above guys, but there's big time upside here if the minutes come to light. When things are clicking for Tony he piles up rebounds, steals, and a few fast break points and can pay 7x-8x points per dollar. Or he can get in foul trouble and disappear completely. Not for the faint of heart, but with some easy chalk above you'll get real separation here. We faded Durant against Minnesota because we were concerned about a blowout, and, oops. The Warriors are -13.5 favorites tonight, but they also have the highest implied total, and blowouts really haven't killed Durant's value this season since he has made up a surprising portion of the Warriors' offense. With Draymond Green likely out again there will be more action to go around, and I think Durant will be a terrific big money option even with the blowout risk here. He's paid 45 fantasy points or better in every game since November 10th, and looks plenty safe here as well. 2 cheap priced options to help you pay up for Durant? Why not.With Justise Winslow out for a little bit, Johnson has been going in there and handily paying 5x-7x points per dollar on these prices in every game except the 11/21 Philly game. Boston plays fast, and there should be lots of counting stats to go around. Carroll has turned in huge performances in 2 of his last 3 games (on these prices), and was just OK against Milwaukee, but he's so cheap here that he should be a strong consideration against a Philly team that has allowed the very most fantasy points to opposing small forwards this season. With Marvin Williams out again, you're going to see a lot of Frank the Tank in cash games tonight. He was an 85% cash game start his last time around, and while he didn't exactly get there for you, the 4.5x points per dollar he paid off are probably his floor. It's not clear if Zach Randolph is playing or not as of this writing, but it shouldn't matter too much. This is just a price/opportunity mismatch that offers a high floor and a huge ceiling. Good God it's been nice to finally get some consistent minutes out of Kristaps Porzingis this season. His shots are trending upward, and he's averaging a cool 21/7 and 2 defensive stats to begin with. That's nice average production on these prices, and with the Thunder playing the league's 6th fastest PACE those stats rate to climb a little higher. We aren't thrilled if Adams winds up covering him, but Porzingis does enough away from the basket that he should be fine either way. Power forward is bad, as usual, and I'll be happy to play Kristaps thanks to the high floor. A weird upside option: Markieff Morris. Morris is all over the place, and was ejected from his last game, but he also has 50 fantasy point upside and not a soul will likely play him tonight. Sacramento doesn't really have a great option to cover him here, and there's an off chance we see a revenge game against the refs. Or he could be terrible. Probably terrible. With Al Horford out tonight, look for whoever replaces him in Boston. As of now I'm assuming Kelly Olynyk, and he'll be a great play. The 76ers have been abysmal against opposing bigs this season, allowing the very most fantasy points per game to opposing 5s. Valanciunas is playing the longest rotations of his career, settling in at low 30s minutes and touching 37 on occasion. With Embiid sitting tonight he will see some combination of Holmes and Okafor, which is only a deal sweetener. Phenomenal center play tonight. I like both sides of the Boogie/Gortat match-up, but there is so much cheap action at center that I don't suspect I'll wind up going there as of this moment. 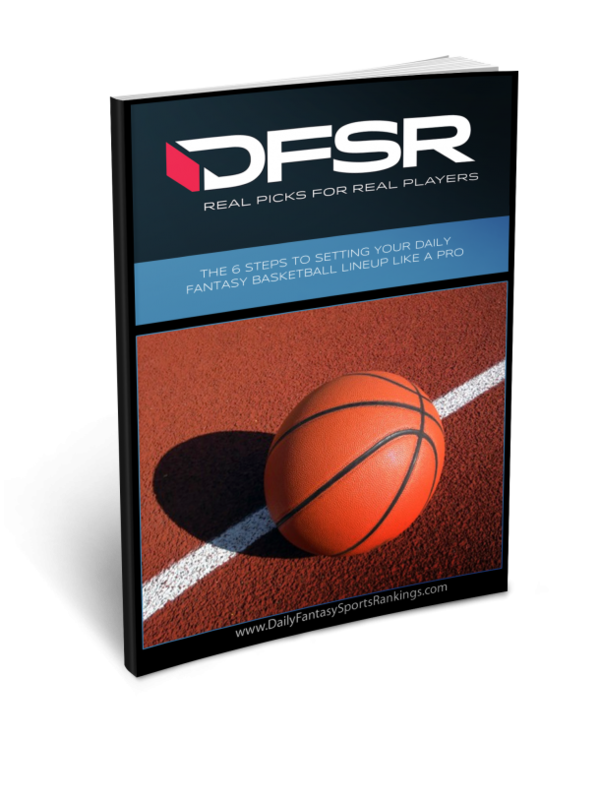 GET OUR FREE EBOOK ON DAILY FANTASY NBA! And Daily Fantasy NBA Picks for FanDuel and DraftKings every day! Carol or JOHNSON? Minutes have been there for JOHNSON, but carol is playing the weaker team. What do we think of Anthony Morrow, after playing 25 minutes Saturday and killing it? At minimum salary, worth a punt at a bad position? Imagine the price in terms of ones instead of thousands. So if a guy cost 4000, think of it as 4. If he scores 20 fantasy points, then he is playing at 5x. That would be 20 divided by 4. Seems like Millsap has been more miss than hit lately. Optomizer seems to like him, even though Draymond is probable. Any thoughts on this?